NEW ORLEANS (AP) — Nick Foles got the Philadelphia Eagles off to a fast start, only to be robbed of another fantastic finish by a veteran receiver’s uncharacteristic drop. 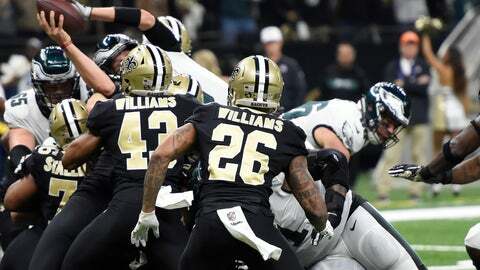 Indeed, Foles had the Eagles inside the Saints 30 with just less than two minutes left when his accurate slant pass bounced off of normally reliable receiver Alshon Jeffery’s hands and fell into the arms of Saints cornerback Marshon Lattimore, virtually sealing Philadelphia’s fate. Time will tell if that was Foles’ finale with Philadelphia. The Eagles might not be able to justify keeping him around as they continue to develop young franchise QB Carson Wentz. But if this was it, Foles latest performance won’t tarnish his Eagles legacy. Foles’ uncanny knack for staying poised under pressure was no less evident in New Orleans than in his previous high-stakes triumphs. He largely mitigated the effects of the deafening din of the Superdome with his calm decisiveness. He was not sacked and made only one pivotal mistake — an underthrown downfield pass that intercepted by Lattimore as the Eagles were seeking to build on their early two-TD lead. “He’s a good quarterback, man. He got the ball out quick. He did a good job of surveying the defense and trying to find out where to fit the ball in,” Saints defensive tackle Tyeler Davison said. “He had good poise in the pocket. But at the end of the day, he can only do what he can do.